The signature recipe at our house has become “Tortilla Soup” and for me it signifies coming home. Just the words alone immediately bring to mind the joy of being surrounded by family and friends. Tortilla Soup has become the recipe we fix every time the kids come home from college, the recipe we choose to greet travelers after a long flight, the one we choose when we want a new friend to feel relaxed and comfortable at our house. It captures, for me, the quintessential essence of peasant cooking at its best–not exactly stone soup, but a kind of “condiment” soup (with all sorts of extras that can be added according to the tastes and desires of the tastee)–and of course there is always the fact that it comes with a Mexican flair! Mexico comes with somewhat of a bad rap these days, but for not for me. Mexico is near and dear to my heart. I’ve been to Mexico over 20 times and many of them have been wild and wonderful adventures. Making Tortilla Soup for me is an opportunity to choose from a collection of memories (sort of thought condiments) to flavor my day–which ones do I want to taste and smell and remember today? If I am very relaxed I might remember the summer I met my husband and we drove down to San Carlos and camped on the beach. I learned to spear fish and caught my one and only fish on the first try–mostly to prove I could do it–after that I always seemed to subtly jerk my hand at the last moment and miss . . . I remember that while driving back home on that trip my car broke down in Tijuana and in the space of an instant, I completely panicked, convinced we would never make it back home – we’d become destitute living on the streets of Tijuana – we’d end up in a Tijuana jail (you know how the mind gets going sometimes. . .) Jay said he’d never let that happen; he would make sure we found our way home even if he had to push the car all the way back over the border. I believed him 100% and probably fell in love that day. I might remember another time, like when we drove from Washington State to the Yucatan Peninsula in an old Toyota truck with an orange wooden canopy – the thing required us to change the spark plugs about every 100 miles and looked so bad even the Mexicans felt sorry for us . . . but we had treasures hidden beneath the scruffy exterior (kind of like we all do) including scuba gear, an air compressor, an inflatable boat and engine. We made our way across the country to “La Playa Mas Bonita Del Mundo” – the most beautiful beach in the world — where we built a hut on the beach from driftwood and palm fronds, and spent days scuba diving and living off our catch. It was paradise . . . until I got barracuda poisoning . . . In later years, we found ourselves smack dab in the middle of a mid-life crisis and decided to escape what we saw as the rut and rat race of suburban living and move with our four and seven year old girls to a remote fishing village in Mexico, called Yelapa. I always thought living in Yelapa was something like life as described in the Little House on the Prairie books. There were no cars, no phones, no electricity . . . we walked everywhere and our days were divided between walking to the big beach for fun and entertainment – a twenty minute walk away one way– homeschooling, and walking to one of the three tiny little grocery stores to pick up food for that day’s meal – oh and checking for scorpions . . . I could write a book about our experiences living in a Palapa in Yelapa . . . but suffice it to say, it was there we came to fully appreciate Mexican cooking: handmade tortillas picked up fresh from a local woman, young coconuts for drinking pulled right off the tree, papaya sprinkled with lime juice, mangoes, black beans, cheese, cilantro, rice, tomatoes, jalapenos, fresh caught seafood . . . oh Yum! My Tortilla Soup condiment thoughts can just as easily transport me to the quiet space of a meditation retreat, for we traveled many times to partake in one that took place in an enchanting old hacienda hundreds of years old set in the hills above Taxco. It was essentially a mini village with cobblestone roads, its own church, a swimming pool, multiple impressive stone edifices, mysterious ruins up vine covered trails, and abundant loquat trees–it was pretty much like being on a Harry Potter set–so magical and the people so wonderful and the ashrama so still. Our teacher used to say that the Mexican people were the closest to God and Mexico was the heart of the World. That is certainly true for me, for it was in Mexico–on a women’s journey led by a toltec shaman and a Mayan priestess and with women from all over the world, that the veil–the one that keeps us from fully experiencing the astonishing sacredness of life–lifted, and I found my way home to my own heart . . . It was immediately after this sacred journey to the heart in Mexico that we were moved across the country to Chapel Hill, North Carolina and it was there that I learned to make Tortilla Soup. Luckily for me, the heart of Chapel Hill was Whole Foods, which was located a convenient 6 minutes from my house. Whole Foods became the source from which I would try to re-establish a feeling of home for our relocated family, who were all missing the companionship and comfort of extended family and friends. During this time, I would wander through the aisles of Whole Foods in bliss–all the beautiful vibrant produce seemed to be glowing–and all our food sensitivities were easily accommodated with healthy and interesting options! I loved going to Whole Foods. It became the center of my day. 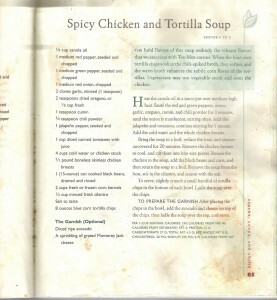 It wasn’t long before I purchased the Whole Foods Cookbook and discovered their recipe for Tortilla Soup. 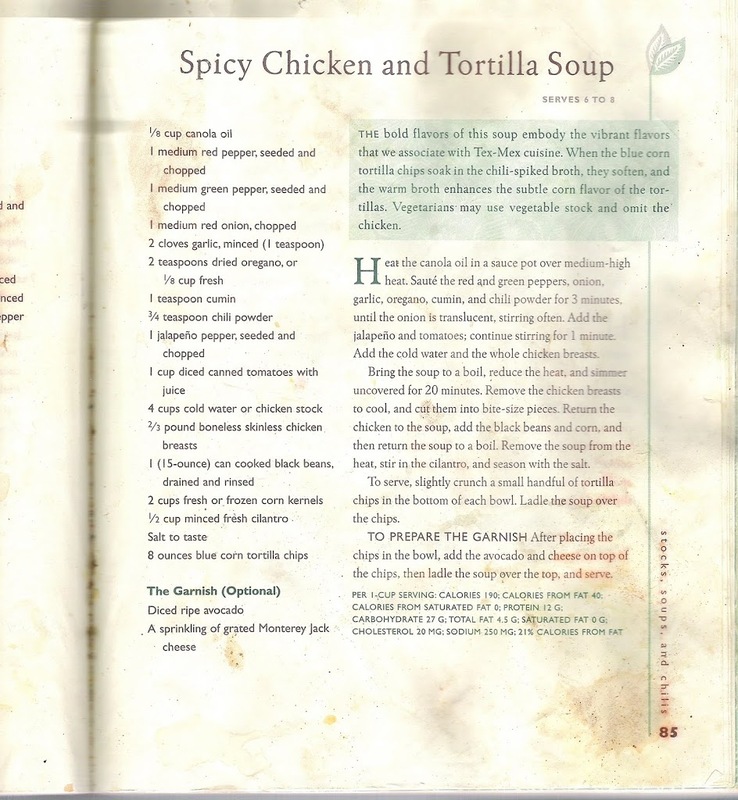 I have copied below the page from the original Whole Foods Cookbook I bought nine years ago. You can see it is a well-loved page. I’ve added a few of my own touches, but not too many. Tortilla Soup has become our family’s comfort food, a symbol of being home, and to this day it regularly graces our table. Well, it seems like it is time to let loose the memories and get on with joy of cooking itself . . . We have an old friend visiting, one that co-incidentally also visited us when we lived in Yelapa. He is a vegan and this recipe is very easy to make vegan. · Saute the peppers, onion, garlic, oregano, cumin and chili powder for 3 minute, until the onion is translucent, stirring often. · Add the black beans and corn and return the soup to a boil, then reduce to low simmer and season with salt. o Serve these separately for guests to add to their soup.